It drives like the perfectly balanced sports boat that it is. In typical Scandinavian style, the Paragon 31 is hugely practical both inside and out. Making its debut at a time when the economy was spinning into free fall, this comparatively expensive boat could have slipped into Scandinavian obscurity. There are quite a few boatbuilders from that neck of the woods whose home demand means we never see them in UK waters. The Paragon 31 could have been one of those. It comes from a Swedish yard whose purist approach to design and construction is virtually absolute across the two hull sizes they build. The Paragon 31 Flybridge is the flagship, with just two smaller siblings: the 25 Open and the 25 Cabin. Such a small line-up is unusual to say the least, but Paragon’s philosophy, based on extensive collaboration with rescue services and coastguards, is that function always takes priority over form. The 31 Flybridge is a perfect example of this mindset. When it was launched in 2009 it had a hefty price tag, which in cost terms stacked up against quite a few bigger sports cruisers. However, this is a totally different craft that appeals to a boater who knows they are buying into a ‘niche’ sector, for which inevitably there is a price to be paid. If you have spent most of your boating career in a RIB or sports boat, the Paragon 31 will appeal. It drives like the perfectly balanced sports boat that it is. It is built on an unashamedly rakish deep-vee hull, with a transom deadrise angle of 24.5 degrees – just 0.5 degrees less than the Hunton XRS37. Its steering is superbly responsive, providing incredible angles of heel in the turns, which, if you are sitting in its flybridge – or ‘coachroof helm’ to be more accurate – will make you feel you can reach out and touch the water on occasions. Regardless of how reckless this boat may make you feel when you drive it hard, it always hangs on, never losing its grip on the water. Anyone who has driven one in earnest will tell you that you will shun flat waters for the rush of driving it in the rough. It cuts with a precision that you would simply not expect from a 33ft boat with a 10ft 8in beam. Its sharp transom deadrise is carried forward to a suitably sharp forefoot, which also provides a very dry ride, as long as you trim out the sterndrive just enough for a bit of bow lift. Any water that does make it past the spray rails and the chine flats comes up against the workboat-like thick rubbing strake that runs around the craft. Its commercial-like qualities go beyond a long strip of fendering, as the Paragon 31 can take pretty much any beating without a creak or a groan. Anyone graduating from a big RIB will still be able to wave-crest from top to top, without worrying about whether their internal fittings are working loose. Not surprisingly, it has a good turn of performance. Power options are either a single 370hp Volvo D6 driving through a DPH duo-prop sterndrive or, like the boat featured in this article, twin Volvo D3-220s on DPS sterndrives. The single D6 will push this boat up to 37 knots, while twin 220hp D3s should hit the 40-knot mark. The single versus twin argument is a long one and, considering how much more reliable engines are now, tends to make a strong case for going for one large engine over two smaller ones. The single D6 will provide better economy mainly through the fact that it only has the drag of one sterndrive to contend with. However, the compact five-cylinder aluminium D3 has come a long way from its earlier lower-powered form, which had a less than perfect reputation for reliability. Consequently twin D3s are a good power option. You might burn a bit of extra fuel at the higher end of the power curve, but the driveability and fun factor of this boat will be improved. Acceleration will be noticeably better, making it more responsive in rough weather when you are powering up and over waves. Berthing will be a lot easier, and you can’t beat the reassurance of having two engines when you are running across the Channel. Both helm positions deserve top marks. The lower helm has perfect ergonomics, with throttles and wheel where you want them, complemented by a sprung helm seat. Apart from across the stern, which by the nature of the wheelhouse design has limited window space, visibility is great. The wrap-around windscreen offers a fantastic forward view, and the abundance of windows on either beam, along with the twin sunroofs, provides plenty of natural light. The twin side doors are a must for any wheelhouse boat, and crucial if you intend to go single-crewed. Of course, the coachroof helm will always be a favourite, weather permitting. It is a simple two-seat set-up, and not surprisingly limited in space. However, the dash has enough space for a second plotter and a few repeaters. It is a quick two steps up, courtesy of the cockpit bench and one recessed step. In typical Scandinavian style, the Paragon 31 is hugely practical both inside and out. Deck access does not get much better for a boat this size. Wide side decks, enclosed by mini bulwarks topped by tall guard rails, make fender duties a breeze. The cockpit, which provides quick engine access through a large deck hatch, is enclosed by even taller guard rails. Impressively, the anchor sits in a fold-out bow roller, which, when not in use, sits inside the anchor locker, giving the impression that the boat has no anchor. A point to note on this is that the anchor and bow roller are quite heavy to fold out, so it is best to ensure that whoever is tasked with dropping the hook can realistically cope with it on a rough day. Alternatively, fold it out when you commence passage, and then fold it back in before berthing. Boats from the Paragon range always impress me when it comes to accommodation. At a glance, you could easily think this boat has nothing more to offer than a convertible dinette and a Porta Potti. It actually manages to pack in five berths. Three berths are located aft in a single cabin, accessed through a lift-up section in saloon seating. Remarkably there is actually a reasonable degree of storage in the aft cabin, and well over 6ft of headroom between the beds. A convertible dinette is located in the forward cabin, providing a second double berth if you need it. Also in the forward cabin, a galley equipped with a three-ring gas hob, a 60L fridge and a sink sits to port. Opposite is located a sensibly sized heads compartment with shower, and, like the space by the galley, it has full standing headroom. The wheelhouse saloon is fine for four, but any more and things could feel a bit cramped. The L-shaped seating set-up works well, with the forward end of it converting to a navigator’s seat. The pole-mounted table slides up into the ceiling when not in use. The Paragon 31 is not often seen in our waters and made all the harder to find due to its initial cost. It is a purist craft whose virtues will not be lost on those that crave the ultimate all-weather middleweight powerboat. It is also a capable jack-of-all-trades family boat that can appeal to those outside of the big boy’s toys brigade. Though it does have some very capable contenders, its uniquely capable character and appearance should keep it at the forefront of its class for quite some time. Both the D3 and the D6 had a few problems during their early production runs. The lower-powered early D3s had problems with their variable-vane turbochargers, but with the D3-220 this has long been sorted. By 2010, most of the main issues that plagued some D6s had been sorted, making the D6-370 a reliable engine. Depreciation generally tends to be low on any boat built in the Baltic. 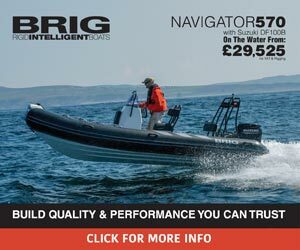 Build, design, seakeeping and the fact that there are very few actually available for sale second-hand in the UK also have a bearing on this. When new, this boat with twin D3-220s would have cost around £220,000, meaning it has lost 20% in seven years, and this is the steepest part of any boat’s depreciation curve. Going forward, depreciation will drop as the boat gets older, making a seven-year-old Paragon 31 a good buy in boating terms. Paragon’s build quality, true to Scandinavian form, is of the highest standard. These boats are built to last and to be used in harsh conditions, so you can expect one to have stood the test of time very well. Servicing for the Volvo D6 will be around £600 an engine for a 100-hour service, and it is always worth shopping around in this department. A pair of D3s will work out at around £900 for a service. Then there is the cost of servicing sterndrives, which is normally done every two years at around £500 a drive whether it is the DPH sterndrive of the D6 or the DPS sterndrive that the D3 uses. Due to the fact that sterndrives spend quite a bit of time in salt water, costs can increase over time. A paragon 31 fitted with a single 370hp D6 will return around 2.5 to 2.8 mpg between 25 to 30 knots. Even if you drive this boat flat-out it will still return over 2mpg, so in boating terms, this craft will not break the bank to run. An example with twin D3-220s will be around 15% less efficient. The pristine boat featured in this article is located at Offshore Powerboats in Lymington. It is a highly specified boat and new to the market. Its comprehensive list of equipment includes radar, autopilot, bow thruster and a full Simrad electronics package including repeaters for the coachroof helm position. It also has the optional 70L holding tank, and teak decking throughout. Other extras include a cockpit table and a transom shower. It is the only used example on the market in this country that we are aware of. It is in ‘turnkey’ condition with full documented history.